So I said a couple of days ago that Russell Crowe was in Newfoundland to play some shows. This is still true, but he is also doing some other projects while out on the rock. 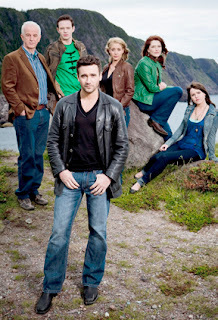 Besides working for free four Newfoundland tourism, tweeting every five seconds about why he loves the place, he is also going to be doing a guest role on the CBC show Republic of Doyle. Alan Doyle, from Great Big Sea and good friends with Crowe, is supposedly going to be in the same episode reprising his role as a criminal. This is huge news for the show. An Oscar winner who is still doing legitimate work guest starring on a small Canadian TV show...unheard of. This is a prime example of 'it's not what you know but who you know.' Crowe hasn't been on a TV show for 20 years according to IMDB.